UI-related richselect is a non-editable combo-box. Visually, the richselect control consists of a text input and popup window that contains a standard list of options in its body. 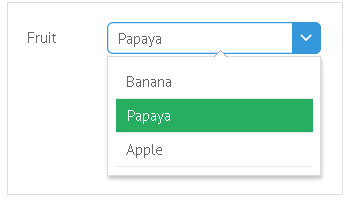 Another possibility to create a component with a similar functionality is attaching a suggest list to a text field, but in this case, text field will be editable. options (array, object, string) - sets the options to choose from in a long or short form. Details. To learn more, go to Advanced Settings of Popup Selectors article. In case of a full initialization form, the getValue() method for richselect will return ID of selected option rather than text. Use getText() method to get text value. $$("field_t").getText() // -> returns "One"